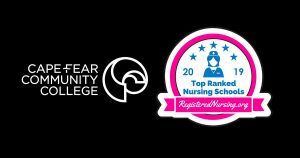 The Cape Fear Community College Associate Degree Nursing program has been ranked number one in the 2019 Best RN Programs in North Carolina. In a recent study conducted by RegisteredNursing.org, the CFCC ADN program ranked first among 30 other RN programs in the state. Programs reviewed include schools that offer an Associate in Nursing (ADN/ASN), BSN, or Direct-Entry MSN Degree. The scores and rankings for each school were determined based on a historical analysis of the National Council Licensure Examination (NCLEX-RN) exam pass rates and test scores. According to the Bureau of Labor Statistics Occupational Outlook Handbook, employment of registered nurses is projected to grow 15 percent from 2016 to 2026, which is much faster than average for all occupations. Upon completion of the ADN program and successfully passing the National Council Licensure Examination (NCLEX-RN), CFCC students may enter employment as a registered nurse. Employment opportunities include healthcare settings such as hospitals, skilled nursing facilities, home health, school systems, private clinics, mental health hospitals, specialty practice areas, and pharmaceutical companies. “I am extremely proud to be recognized for student success by RegisteredNursing.org. Our nursing faculty and staff do an outstanding job of educating and supporting our students. It is critically important for our students and our community that we remain steadfast in our pursuit of even greater gains through sustained dedication to academic success for all students,” said Dr. Angela Ballentine, dean of health sciences.